Today I thought we'd take a little tour around my garden to see what's been blooming lately. Let's start with this really cool bearded iris. Its color is a very pale yellowy-gray. It's hard to describe (it's less yellow in real life) but I really like it. And do you see Fiona in the background? She's a bit gray herself! Here are some striking purple and white irises, which I got from the same gardening friend who gave me the peonies. The little cat garden is in full bloom with valerian, as well as catmint. James and Fiona approve. Here's the valerian close up. Birgit had mentioned valerian pillows, little fabric squares filled with dried valerian, that are made for cats in Germany. I'm going to save the leaves and borrow my friend Aunita's sewing machine (and, most likely, her leftover bits of fabric) to make these this fall. I have two fairly large "wild beds," to the north and south sides of my backyard. They both have been overgrown with buckthorn, despite my best efforts. This is the eastern end of the north bed, looking a bit more under control these days. I put pine needle mulch on them in the last year and that really seems to help keep the weeds down. (But not the poison ivy, alas!) Apparently pine straw is a popular mulch in the south but here in Michigan it's rare and expensive. Fortunately my mom has several huge red pines and a lot of patience for raking up their fallen needles! Contrary to popular belief, this mulch doesn't acidify the soil (only slightly over time as the needles break down but they take forever to break down, which is what makes them good weed blockers!). Jimi enjoys rolling on the cement pavers and fitting in between two sets of tiny leeks. This is my front vegetable bed before I weeded the center and planted it yesterday. Voila! I know it doesn't look like much from a distance, but it will fill in, trust me. You can see horseradish to the top left and the four baby leeks along the bottom left. That's a mum at the bottom right (it had nowhere else to go! ), plus three tomatoes at the stakes, a dahlia at the wooden stake, marigolds at the right, interplanted with onions. We've had an unusually cool and cloudy spring, which has somewhat stunted the growth of warm-weather veggies. I have very few areas that get full sun, so this strip along the driveway is ideal. Here is one of the tomatoes, Gajo de Melon, close up. Also in this bed are Big German Pink and Ladino di Panocchio. I also created a second veggie bed along the southeast corner of my house. I had to dig up a whole bunch of artemesia first, which took a really, really long time (and various choice curse words) and I'm sure I still didn't get all the roots. I planted three heirloom tomatoes I winter-sowed: Ukrainian Heart, Olga's Yellow Round Chicken (I love that name! ), and Red Russian. Upfront are banana peppers and 'Mini Fingers' eggplant; in containers are zucchini and beans (hopefully out of groundhog reach, but who knows). I also lost some tomato seedlings in a frost, which I've reseeded but which are too small yet to plant out (cool overcast spring blah blah). They are: Avivvi (see Debbi's blog for what they'll look like as fruit), Azoychka, Bisignano #2, Canestrino di Lucca, Caspian Pink, Gillogly Pink, and Turk’s Mutts. (I got all the mater seeds from Royer Held, a local heirloom tomato guru.) I also reseeded green and jalapeno peppers. I'm going to need to expand the beds to plant them! I also planted garlic (no photo) and a few things in containers. My lettuces are coming along nicely: the greener leaves are Asian Baby Leaf Mix, the redder (and harder to see) leaves are Merveille De Quatre Saisons. This is chard 'Bright Lights' (in pot and up high to outwit wildlife) and chives (in jail). And here, in pots in the garden, are garlic chives and rosemary (the former to contain it, the latter because it has to come in over the winter). Just out of view is flat-leaf parsley. Moving onto flowers, my baptisia is blooming. I love its vibrant, saturated blue (and Jimi's ears!). Speaking of vibrant blue (that the camera didn't capture, unfortunately), one of my three spiderworts is blooming. Blue-eyed grass is also one of my favorite blue plants. And although much paler blue, I still love the nigella as well. Moving to yellow, I have some really cool creeping sedum that bloom yellow. And some nice yellow alliums nearby. My ninebark 'Diablo' shrubs are huge this year, at least 6 feet tall and 4 feet wide, despite generous pruning last spring. And look at all these blooms. Noogie! Here's another shrub, 'Little Henry' sweetspire. It's been struggling for years, is maybe only a foot tall. I think I've found (after several tries) a good location for it, and it's sending up flower spikes! Here's the path to my front door, looking south. If you come and visit, that's what you'd see heading for my front door. Here's Jupiter's beard close up. It will bloom again later in the season after I cut back the first spent set of blooms. And, finally, in the good news/bad news/good news again department, you may recall that I bought two red yuccas (Hesperaloe parviflora) last year after being so taken with them on a trip to Colorado to visit my niece. They are rated for zone 6 and I'm zone 5. I planted both in what I considered protected, microclimate locations and made sure they were covered in as much snow as possible (insulation). They both looked great until about March when we stopped having snow and they looked dessicated and brown. One died; it detached from the roots when I gave the shriveled foliage the slightest pull. The other looked just as sad but seemed attached firmly to its roots. I removed the dead leaves that easily pulled off and left two that wanted to stay attached. Later I noticed they had grown a green base. I cut off the brown part and hoped for the best. Then I got distracted and forgot all about the plant. The other day I noticed the old stalks had grown and a few new ones had come up. The plant is still small, but it's alive. Yay! Please send good thoughts its way, as I'm sure we'll need to get through another winter before it decides to bloom. And the other good news is, I'm going to Colorado again in July for my niece's renewal of wedding vows. And I almost forgot to show you these cool garden boots! My Spring Fling swag bag had a gift certificate for gardenshoesonline.com and I ordered these boots and some hiking socks. Fun! I had to laugh when you mentioned the "fun" involved in digging up artemesia--I did that last spring, and was sure I got it all out. Go figure, I've got plenty of it coming up again this year! I love the boots. So different and different is what I like. Your walk to your front door is lined nicely some pretty colors. Looks like you stay quite busy with so many spots to garden. I love it. Great post, so much going on now at your garden! We especially love the presence of your gardening cats. About the valerian: We're not entirely sure but think it's the roots that are attractive to kitties... Mom got us two plants too this year and they are blooming away at the moment. What a lovely and welcoming front walkway! I had to get that out right away. I do like your long shots and it looks like spring? early summer? has arrived in the great white north? So glad. I agree with you totally on the pine needles. Folks worry needlessly. I'd love to have a reliable source for gorgeous pine needles. It looks so good Monica. And I too have that valerian. What is the secret to get it to spread?? Hi Monica, Oooh, I love your front walk! So many pretty things blooming in your garden - I especially love all the blues. The yellow-gray iris looks huge! I miss iris. I drove past my old house over the weekend and they were in full bloom. I'm glad the new owner kept the gardens, and I enjoy seeing all my old plants still there and blooming. My tomatoes aren't doing much either - they probably would have grown more if I'd left them in the basement under the light for a few more weeks. Oh well, I'm sure the hot weather will arrive sooner or later, and later would be fine with me, as if I have a choice! I'm impressed with how many really cool veggies you have! (Yum!) And LOVE the boots - very cute! Lucky you getting one of those gift certificates for Garden Shoes Online! I love the inviting pathway to your home and your really cool pale bearded iris ... but the boots, Monica ... if you find them missing, please know I could not contain myself! 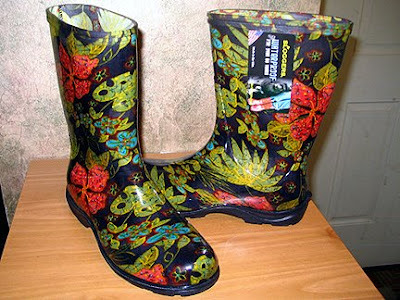 Wow, Monica, those are the funkiest-looking garden boots I've ever seen! I don't think I'd want to wear them in the garden for fear I'd get them dirty. I still haven't used my Ethel gloves for the same reason. You have a lot going on in your garden! I love the Baptisia and the plicata iris! Your garden looks fresh and lovely, especially as we're heading for 100 degree temps this week (it was 99 today). What an inviting approach to your front door! Love your new boots and all the blooms gracing your garden. Glad to see the gray cat. It looks just like one I lost and now I know where it lives! Nine lives and all. Love the baptisia...and all the kitties in the garden! The valerian pillows sound interesting - do they have the opposite effect from catnip pillows? Hey Monica, love the boots! Your nigella is beautiful. None of mine sprouted. Don't know what I did wrong--maybe planted it outside too early. I added Jupiter's Beard to my garden this spring. It's starting to bloom now. People have said it isn't reliable in this area, any tips on keeping it healthy? Your brick walkway is lovely. Oh and the yellowish iris, what a great color. Your flowers and cats all look quite beautiful. I especially love the view coming up your front walk--lovely! I understand having only 100 fav. flowers at any given moment. I have never met a flower I didn't like! I would be glad to send you some of our heat to help your maters along--we have plenty to spare! The boots are awesome! I like the view along the garden path.....such a pretty garden. I knew cats like nepeta but did not realise they like valerian. How many cats have you got in total? We had a very cold spring....really strange though the garden is so full on I cannot keep up with it. I have put so much through my shredder already, it is amazing. Monica, wow, you've got a garden full of blooms. All the blues are grogeous-as are the others. Your tomatoes are looking good and you will have ripe ones before you know it. We are getting ready to get a truck load (or 2!) of mulch and am taking your advice and getting pine. I am excited to learn we can use it and not worry about acidity. Thanks for sharing that info. Lovely! All the flowers and the cats!